Fleet management: you’ve heard the term, but are you certain that you know what it refers to? The two words umbrella a diverse set of responsibilities and business concepts that are vital to many different companies and types of service. It includes tools that help you minimize costs, keep your investments and your employees safe, and helps ensure you stay ELD compliant. Use our handy guide as a cheat sheet to get your know-how started, and learn how GPS technology is vital to the job as it stands today! If your business spreads its goods and/or services beyond its home address and has to maintain oversight over multiple sources of transportation while doing so, you require some form of fleet management. Obviously, the further your drivers are going and the more of them you have on the road at the same time, the stricter that oversight has to be, but the concept boils down to this: it’s oversight of employees while they’re out on the highway and too far away for you to keep an eye on personally. In ye days of old, this was accomplished entirely through good faith and a lot of paperwork, but the advent of GPS-based locating technology and almost-omnipresent Internet connections have changed the game to give managers broad access and real-time tracking of just about everything a driver is doing on the other side of the continent. Why is fleet management important? Driving is an everyday fact of life, but it’s a risky one that comes with a good dose of unpredictability and danger, too. While they’re on the pavement, your employees are representing you and your brand, and they have a lot of different responsibilities to juggle while making sure they don’t taint the reputation of either. Are they making good time and getting to their destination when the customer expects them, but also driving smartly and safely while doing so? Is their vehicle staying in good condition? Are they on the road during appropriate hours? A fleet manager has to know the answers to these questions and be able to make changes to operations if they aren’t satisfied with them. Acquiring new vehicles and upgrading old ones; designing fuel programs and driver schedules; following national guidelines for transport and documentation: there’s a lot to keep track of, and most of it has to be done while the workforce is thousands of miles away. The ultimate goal of a business is to make money. You have to spend it to make it, but the less you have to spend, the more you can make in return. If your investment is in vehicles and using them to get your services across vast distances, things get pricey. A set of wheels by itself — particularly if it’s the kind of heavy-duty truck necessary for hauling — comes with a large price tag already, but there’s also all of the upkeep that comes with it: regular refuelings, routine maintenance for natural wear and tear, accident repairs, insurance to help cover said accidents… the list goes on. Fleet management gives drivers and their higher-ups the data they require to plan for these things as best they can, to retroactively track and proactively plan on how to increase efficiency and minimize cost. What are the quickest routes to the destination? Which are the most fuel-efficient? Are the drivers obeying speed limits and hours of operation? Are their vehicles in need of inspection, or ready for an upgrade? 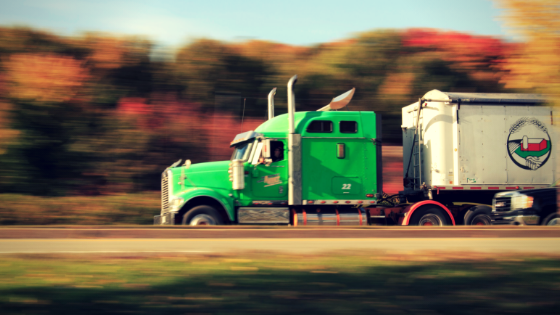 If you’re going to make your employees spend long hours on the road in remote areas of the country, barreling down highways in very large, very heavy pieces of metal at high speeds, you need to make sure they stay safe. Granted, most of that is up to them and how they handle themselves behind the wheel, but there’s plenty that a good fleet manager can (and should) do to keep risks minimal. With the ‘eye-in-the-sky’ oversight that new technologies give, managers can keep tabs on their vehicles in real time, helping drivers avoid accidents and busy roads, alerting them of potential mechanical issues, and addressing dangerous behavior (like late-night driving and high speeds) before it becomes a habit. Remember that mention of yesteryear and its reliance on paperwork? That time — which rested on the hope that employees followed the rules and stayed honest while they weren’t being watched — was at first the old standard that “traditional” companies could still rely on while others were making a fuss about swanky new technology. In 2015, however, the Federal Motor Carrier Safety Administration (FMCSA) released a mandate that has since required all fleet managers to adopt electronic logging devices — ELDs — with their vehicles. The transition has been a bumpy one, with plenty of confusion over what types of devices are considered acceptable by the new laws, but the result is that, as of 2017, the technology is mandatory, and businesses who don’t comply face fines and restrictions of increasing severity. Using a fancy service that lets companies view their fleet’s current speed and location isn’t just a handy perk for those who want to modernize anymore: it’s the new standard that an entire industry now revolves around to adapt to a changing workforce and economy. Is GPS tracking part of fleet management? Thanks to the ELD mandate, it is now! GPS-based tracking is the lynchpin for how the technology functions, and the biggest reason why it’s considered such an essential evolution in fleet management. Having a vehicle connected to a worldwide satellite network gives a business all kinds of real-time (or at least regularly refreshed) updates on what is currently happening with their drivers, no matter how far away they may be. The most significant detail that ELDs give is, of course, location, letting managers see where an employee currently is and what route they took to get there. It gets much more itemized than that, however: transmitted details can also include whether the employee is on the clock or not, whether the engine is running and/or in motion, vehicle speed, miles driven, fuel levels, and mechanical warnings. Some models can even send an alert when a hard brake is made! ELDs bring with them the potential for micromanagement and constant surveillance, and GPS tracking is what makes it all possible. Fleet management is all about creating order in a business that dabbles in the chaos of being spread thin across many, many miles. There are many moving pieces to keep tabs on, and a lack of centralization needs a firm hand to make sure that all of the cogs in the machine are turning smoothly without wasting resources, be it time or something more material. New advances in technology have allowed the GPS-based capabilities once limited to governmental surveillance to make this job easier and more accurate for everyone involved, and continued innovation lies ahead as the industry faces new challenges and demands in the years to come. What could the road going forward hold? It could be bumpy, but those managers will stay the course as they always do. It’s what they’re good at, after all!